Move Your Piano Anywhere in Texas! You shouldn’t trust just anybody to move your piano. It’s more than an instrument. It’s an investment, an heirloom. Not only that, it’s incredibly difficult and a single slip up can cause irreparable damage that could ruin your piano. Your buddy Ron with a truck doesn’t know all the pieces of wisdom you pick up from over 10 years of experience moving pianos. He doesn’t have a piano board or piano cover to safely move your piano to his truck either. When you’re looking for a piano mover in Dallas, or anywhere in Texas for that matter, do your research and make sure that they have extensive experience relocating pianos. You’ll find movers that claim that they move pianos, but they’re actually just a moving company that says they move pianos too. We provide professional piano moving and storing services. That’s it. That’s our specialty. We’re a family owned and operated piano moving company based out of the DFW Metroplex. For over 10 years, we’ve been moving pianos of all shapes and sizes all across the great state of Texas. You piano is in safe hands and you can rest easy knowing that you have a professional piano moving company on the job. Get in touch with Piano Movers of Texas today to get an exact piano moving quote! We Move All Types of Pianos in Texas! Whether you have an upright piano or a concert grand piano, we’ve moved it. We’ve been in the piano moving business for over a decade and we’ve moved thousands of pianos in that time. No matter where you are in Texas or what size piano you have (or how many you need moved), we can help. Dallas is one of the fastest growing cities in the US and the same goes for the DFW Metroplex. Dallas, and suburbs like Plano, is an incredibly desirable place to both live and work with numerous national brands moving their corporate headquarters to the Dallas metro area. If you’re one of the 1.3 million people that calls DFW home, you’re well aware that the area is booming and quickly becoming the next Houston. Moving a piano in Dallas can be incredibly hectic and stressful. Do yourself a favor and leave it to the professionals. 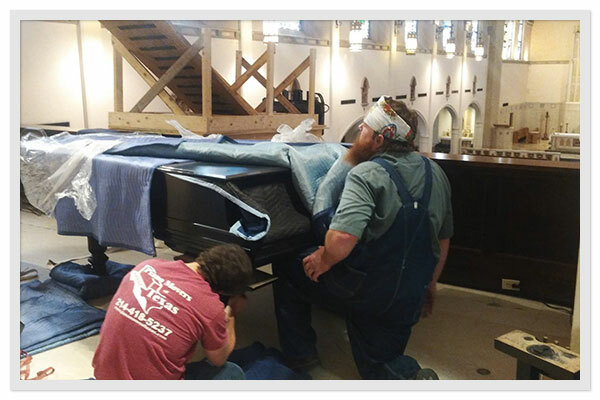 Whether you have an upright piano that’s been in the family for generations or a brand new concert grand piano at a venue, we’re the Dallas piano movers you can trust. We have the knowledge and expertise to safely move your piano from Dallas to anywhere in Texas. We provide our professional piano moving services to the entire DFW Metroplex and the surrounding areas. We’ve been one of the top piano movers in Dallas for 10 years running and our commitment to excellence guarantees that your piano is in safe hands. Even though it’s not the capital of Texas, Houston is (by far) the most populous city in our great state. Nearly 2.4 million Texans call Houston home and have access to one of the most diverse cultural museums and an incredibly active theater and performing arts district. These magnificent attractions draw nearly 7 million tourists to the Houston area every year. Houston is also situated near the Texas coast which puts it in the way of many tropical storms and hurricanes during the summer time. It’s incredibly important to protect your piano from Houston’s weather which is why we recommend trusting a professional piano mover in Houston to do the work for you. Moving a piano isn’t easy and a lot can go wrong in an instant if you don’t have the experience and proper piano moving equipment. (The same can be said for storing a piano in Houston with the threat humidity poses.) Our piano moving specialists have moved every type of piano from nearly every type of location. Do you have an upright piano in your den? We can handle it. Do you have a concert grand piano on a church balcony? We can handle it. We take great care to treat your piano as if it were our own so your Houston piano move goes off without a hitch. Austin is the capital of Texas and it’s where everything is happening. It’s one of the fastest growing cities in the state (and the country, Fortune 500 companies are flocking to the area for their corporate headquarters, the music scene rivals that of New York or LA (Austin’s better), and it’s been rated the best city to live in the US for 2 years running. Austinites are super creative and musically inclined so it’s not surprising that we get a lot of requests for piano moving and storage in Austin. Whether you have a piano in a speakeasy, your home, or a concert hall, you can rest easy knowing that your piano is safe in our hands. Our expert movers have handled every type of piano from uprights to concert grands. We have the experience to get your piano from A to B and safely store it for as long as you need. Your piano is in good hands. Get your free quote today!